This is a great video showing experiments from SeaLab III. "SeaLab III was a 1968 Navy experiment in which five diving teams of eight aquanauts lived for a 12-day period in a sea-floor habitat placed at a depth of 620 feet off San Clemente Island, California. The Deep Submergence Systems Project. This film describes the SeaLab III project. It includes footage of the SeaLab habitat being lifted from the deck of a ship and deployed at sea. It shows divers working underwater during the deployment of the habitat. It includes footage of SeaLab III aquanauts working with navy-trained porpoises." SEALAB III used a refurbished SEALAB II habitat, but was placed in water three times as deep. Five teams of nine divers were scheduled to spend 12 days each in the habitat, testing new salvage techniques and conducting oceanographic and fishery studies. Preparations for such a deep dive were extensive. In addition to many biomedical studies, work-up dives were conducted at the U.S. Navy Experimental Diving Unit at the Washington D.C. Navy Yard. These "dives" were not done in the open sea, but in a special hyperbaric chamber that could recreate the pressures at depths as great as 1,025 fsw (312 m). According to John Piña Craven, the U.S. Navy’s head of the Deep Submergence Systems Project of which SEALAB was a part, SEALAB III "was plagued with strange failures at the very start of operations". 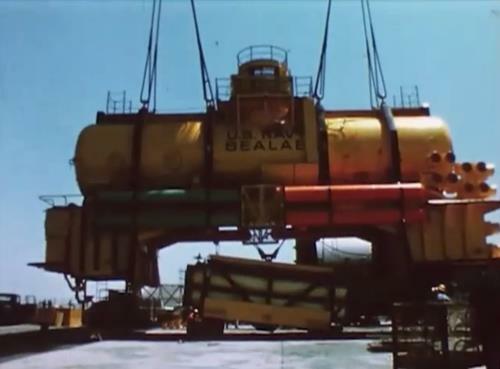 On February 15, 1969, SEALAB III was lowered to 610 fsw (185 m), off San Clemente Island, California. The habitat soon began to leak and four divers were sent to repair it, but they were unsuccessful. During the second attempt, aquanaut Berry L. Cannon died. It was found that his rebreather was missing baralyme, the chemical necessary to remove carbon dioxide. Surgeon commander John Rawlins, a Royal Navy medical officer assigned to the project, also suggested that hypothermia during the dive was a contributing factor to the problem not being recognized by the diver. According to Craven, while the other divers were undergoing the week-long decompression, repeated attempts were made to sabotage their air supply by someone aboard the command barge. Eventually, a guard was posted on the decompression chamber and the men were recovered safely. A potentially unstable suspect was identified by the staff psychiatrist but the culprit was never prosecuted. Craven suggests this may have been done to spare the Navy bad press so soon after the USS Pueblo incident. The SEALAB program came to a halt, and although the habitat was retrieved, it was eventually scrapped. Aspects of the research continued in classified military programs, but no new habitats were built. The SEALAB II/III habitat is located off the Scripps pier in La Jolla, California.